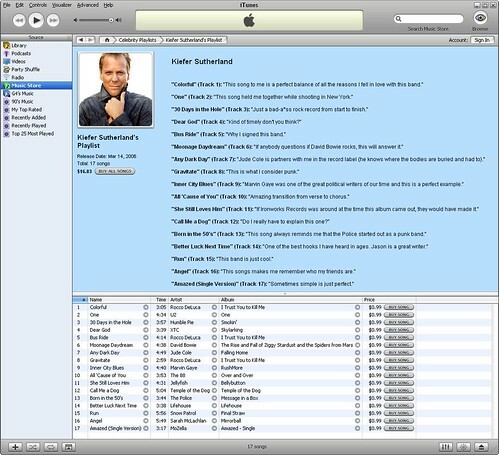 One of my favorite actor, Kiefer Sutherland, want to share with you his music preference at Celebrity Playlist @ iTunes Music Store. And I know, I’m going to buy all songs in his list. Don’t you know he’s the only guy appearing on my desktop wallpaper? For more information about Kiefer, visit The Official 24 Website & one of his fans’ website, get to know more about his biography and Ironworks Music, the music label, recording studio and production company he owns. Don’t forget my favorite: Mac TV Ads with Kiefer’s voice-over. He’ll appear as voice-over for Ryan’s father, Samson… which is a lion (:P), in the upcoming Disney Walt Disney Pictures’ latest animated adventure, The Wild. Go and watch the trailer. you go to my blogspot please…ok? and comment! Just found that Season 5 of “24″ will be broadcasted on TVB Pearl (HK) every Tuesday night at 22:35. Come and watch Jack Bauer with me!!! I am a regular mac user, and visit Apple’s website everyday. I know about Kiefer’s list from the apple.com. You can launch iTunes Music Store using iTunes, and select “Celebrity Playlists” in the left column. Kiefer’s playlist is released on Mar 14, 2006. Click see all and find in pages months ago. Bauer is super, I really think they should hurry up with the film if they’re going to get on with it! Love your site guys such a good source for me to know more about the upcoming TVB Series. I am now studying in Canada and I usually spend around 1-2 hours a month watching TVB series. These all remind the days when I was in Hong Kong.